Join the Dancing Darlings, Olivia and Sophia, as they help support Lurie Children's Hospital of Chicago. 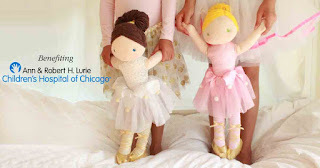 For every Dancing Darling sold, Zubels will give a portion of the proceeds to Lurie Children's Hospital. Be a part of helping them achieve their mission to provide the promise of a cure, a safer space and a healthier future for every child. Dancing Darlings by Zubels. With every purchase, Zubels will give a portion of the proceeds to Lurie Children's Hospital of Chicago. Be a part of helping them achieve their mission to provide the promise of a cure, a safer space and a healthier future for every child. Dancing Darlings by Zubels. With every purchase, Zubels will give a portion of the proceeds to Lurie Children's Hospital of Chicago. Be a part of helping them achieve their mission. On orders $25 or more. Use coupon code FALL for 15% off. What an adorable gift idea. And it gives back too.